Signing the deal and handing over the keys to your client is the most fulfilling feeling for any realtor. However, to get that deal you need your realty business to stand out amongst the rest. 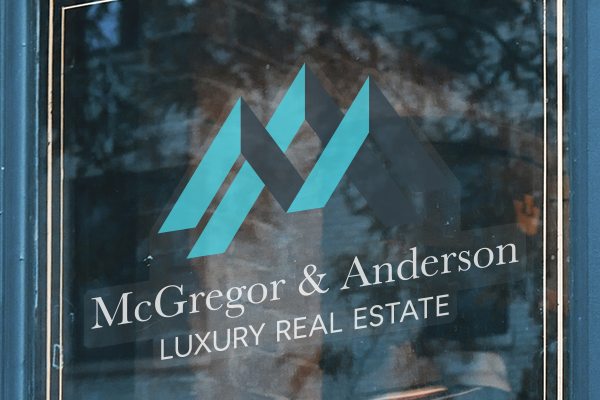 As of last year there were over 50,000 licensed realtors in the Greater Toronto Area. In such a saturated market, ensuring your open houses are the ones clients go to is a must. Here are five unique ways to unlock the door to a successful showing. It can be difficult to draw in a sufficient amount of potential clients to an open house, especially if you’re busy showing the house as well. 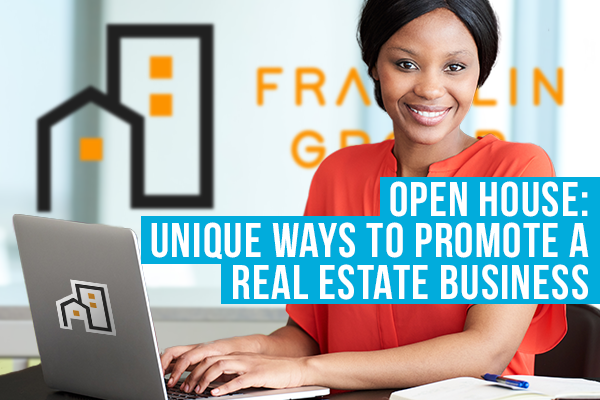 To get the attention of passersby and future homeowners, put your open house right in front of their feet - literally. 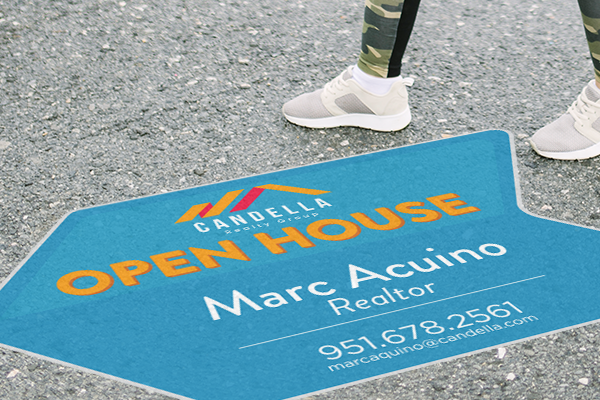 A custom street decal directing pedestrians to your open house is a great way to ensure everyone who walks by takes notice of your open house, and makes it easy for potential clients to find. Street decals are made to withstand the elements and the toughest of footwear, so your street decal will always remain intact and visible. Window decals are a great way to catch the eye of clients or pedestrians looking for your open house or office. StickerYou’s custom clear window decals are printed with vivid CMYK colours and can even handle white ink, meaning all your current branding will stand out with incredible visibility even with a clear background. Best of all, our clear decals are easy to remove and don’t leave any sticky stuff behind, so your window signage won’t do any damage to windows that aren’t yours. 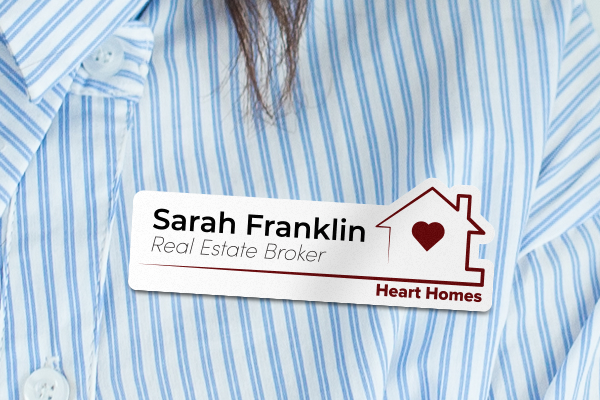 Magnetic custom name badges are a great way to add some professional cohesion to your team. And custom name badges aren’t just for names. Include your employee’s roles, areas of expertise, or even seniority to make it clear to client’s who’s who. Polystyrene badges can be cut into the exact shapes of any logo, so your branding is always visible. Badges can also aid in open houses because they immediately let potential home buyers know who they can direct concerns or questions to. There’s a reason magnets have withstood the test of the time as popular swag: because they make messages really stick. Customizable magnets are a useful promotional tool because they can be printed with logos that include your contact info or hours of operation, and people are likely to use them to attach pictures or documents to fridges or cubicle walls. This allows clients to always be aware of how to get in touch with you if need be. Custom magnets can also be made in various sizes that are large enough to be put on cars or vans, so you can promo on the go! A small token of appreciation to welcome your clients into their new abode can make a big impact. Small welcome gifts awaiting new homeowners shows clients that their patience and understanding throughout the process hasn’t gone unnoticed and assures them that they chose the right real estate business for their home-owning needs. 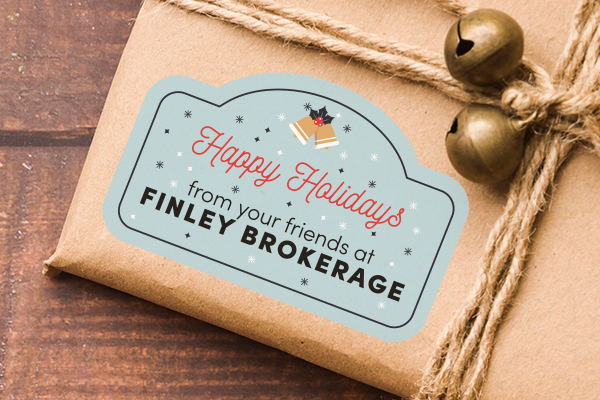 Create custom thank-you labels with appropriate branding from you and everyone and at your firm. This little gesture can also influence clients to spread the word and recommend your realty business to other future home-owners.